A turbocharger is a way of forcing more air into the engine than is allowed naturally. It is a compressor driven by the engine's exhaust gases. When we add more air to the system we also add more fuel. This allows the engine to move more air than was previously possible, in a way simulating an engine of higher displacement. Turbochargers continue building boost until they run out of efficiency or until they are bypassed by a wastegate. 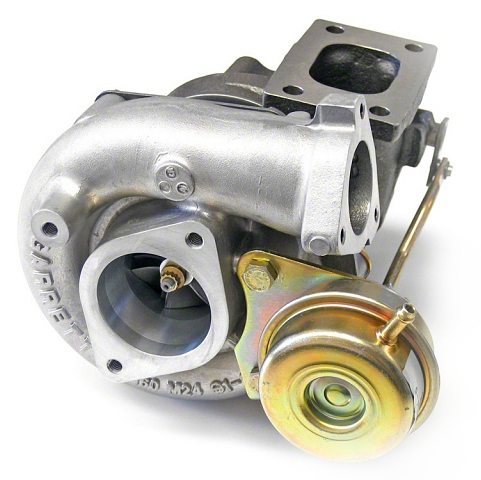 A wastegate allows air to bypass the turbocharger turbine, controlling boost levels. Depending on the size and configuration of the turbo we can change it's efficiency for a specific engine size and power level. Changing your boost levels is done by altering at what boost pressure the wastegate opens. More efficient. Turbos are more efficient than superchargers by using exhaust gases instead of sapping from the crank pulley. This means more power! Less heat. Turbos don't make nearly any heat until they are in boost. Also, with a decent exhaust system, lots of the extra heat can escape the engine quickly. However, they do still make heat. It is recommended to either use an intercooler or water injection. No added maintenance. The turbo shares oil with the engine, so when you change your engine oil you are changing your turbo oil. Superchargers require separate oil changes. Turbo lag. Turbos run off the engine exhaust, which means they are slower to build boost than a supercharger. This turbo lag gets worse the larger of a turbocharger you have, meaning big power comes later in the RPM range, but with a big punch! Narrower power band. Turbos are more efficient at making power, but they can do so on a smaller RPM range. Oil plumbing. Turbochargers require an oil feed and an oil return line. This means custom plumbing that takes time and design. Custom exhaust. Turbochargers are all not one size, meaning there are not many off the shelf exhaust systems, if any at all depending on the application. They also run on exhaust gases, and those gases have to get there somehow! This translates to lots of custom fabrication. In summary, turbochargers are a challenging, but more efficient way to add power to a car. Usually they can result in higher power levels than a supercharger. Often it is the way to go for crazy builds. What is required to install a turbocharger? More fuel. With more air comes the need for more fuel. If your car is already fuel injected, great! The smallest size injectors we offer with our fuel injection kits will support a good bit of boost. If your car is not fuel injected, we recommend converting! Exhaust. Turbochargers require a whole new exhaust. Turbochargers hate back pressure, 1 1/2" primaries should work well for mild builds and 1 5/8" for higher boost applications. Drivetrain upgrades. Turbocharging is a large jump in power, even at the entry level! At a minimum expect to upgrade your clutch, or at the very least replace it with a fresh OEM one. When the boost comes on we want your tires to slip, not your clutch! Also take into consideration other drivetrain parts, such as axle strength and transmission health. Brakes. More power means more speed. If your brakes aren't up to the task, you may find yourself in trouble! Although this isn't necessarily an upgrade, we definitely recommend making sure your brakes are in safe working order. Gauges. With a turbocharger comes more heat. It also puts more stress on the engine. Having a way to keep an eye on temperatures, oil pressure, air/fuel ratios and boost levels is a good way to monitor your engine. This way you can make sure you aren't making too much boost, or overheating your car.